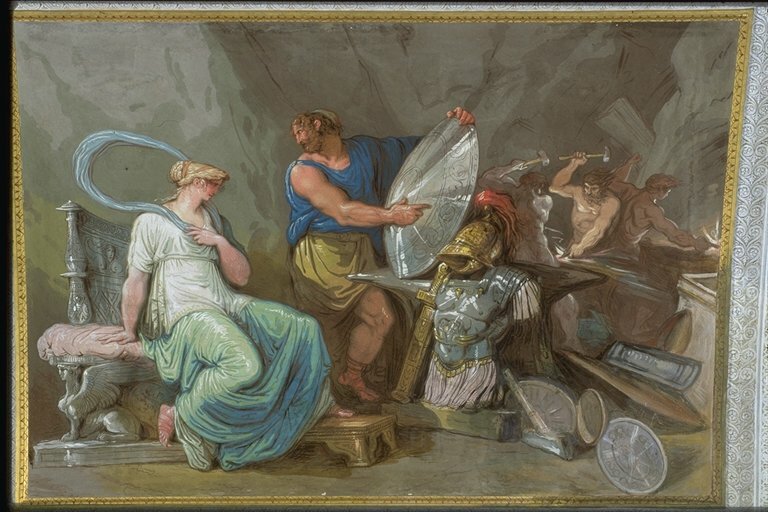 Did the fabulous Shield of Achilles forged by Hephaestus ever exist? Commanding a presence for something like 3,000 years so far, the existential reality of Achilles’ armor in art throughout the ages leaves little wiggle room for those who discredit Homer’s account of Achilles’ Shield. Powerfully firing imaginations since the very first telling, Homer’s ancient narrative of Hephaistos forging the ageless and invincible weapons of Achilles has leaped into visual existence in creative bursts throughout the course of recorded history. Recognized as Western civilization’s oldest form of writing about art, Ekphrasis was invented by the ancient Greeks. In fact, Homer’s description of Achilles’ shield in Book XVIII of the Iliad is considered the earliest and greatest example of ekphrasis. Although the ekphrastic tradition carries the goal of creatively describing a beautiful work of art as if it were real, this literary tradition likewise hopes to make a reader envision a creation that, in fact, never existed. Or do we only believe that any given figment of ekphrasis never existed because we didn’t really ‘see’ it? 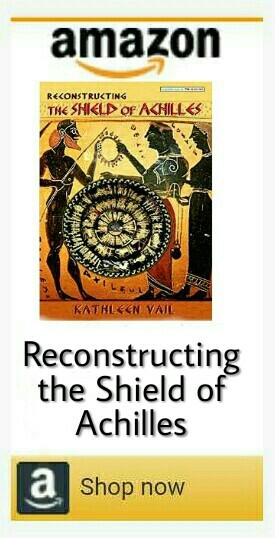 Put simply, perhaps we just prefer believing that Homer didn’t really see the glorious shield he describes so wondrously? Well, this may be the simpler explanation, after all, since not just the armor but Homer himself may have been only a figment of human imagination, and perhaps a blind figment, at that. Not to mention that such stunning armor is, from the start, attributed to the work of an Ancient Greek deity. Perfectly made, they had speech, wit, and motion, and other skills immortal. Gracefully waiting for him to join her upon a silver throne. But are you in need, my dearest Thetis? Your visits are so seldom. “Never has another Olympian goddess suffered such sorrow and pain. Had ever been given a sea nymph to wed, nor gave her a cheerless bed. And though my man is constrained now by age, pain continues to mock me. I nursed and raised the son gifted to me; he became a man above men. Quickly he grew, and I nurtured him better than blossoming orchard trees. And I shall not see him in Peleus’ hall, his family home, again. And I do not have the power to help him, though I stand nearby for comfort. “The girl-prize given him by the Greeks, Agamemnon took back for his own. Hot burned the heart of my son at this deed, and he yearned for the girl intensely. Trojans in war beat them back to their ships, and the Greeks could not escape. Agamemnon’s officers begged my son’s help and offered him incentives. But armed Patroklos in his own gear, and sent him into battle. But Apollo spied Menoitios’ great son slaying many Trojans. Killing him in battle, he then gave Hektor a hero’s reward for the deed. “It is for this I have come to call: now my ill-fated son needs a shield. A breastplate, too, and a crested helmet, and a pair of tight-clasping greaves. Enheartening her, the Great GameLegs said, “Have courage, my Lady! Please trust me! Leaving her then, and going to his shop, he swiftly set about working. Twenty smart bellows he aimed at the fire, stirring the coals up fiercely. Huge bursts they could blow if the toil was tough, and delicate breaths as needed. He spoke his commands and the bellows obeyed, fully used to the work required. Molten gold and silver boiled in the blaze, and tin, and Olympian bronze. 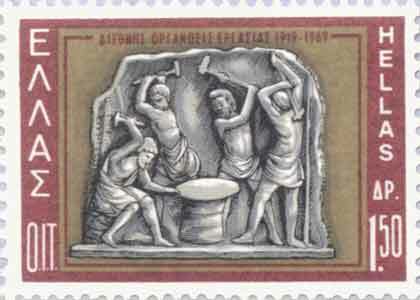 Hephaistos mounted the great iron block, knowing that all was in order. His first task fulfilled was a well-fashioned shield; very strong, wide and shining. Triple-ply was the sparkling rim around it, and the shoulder strap was silver. Just the Stuff of Ancient Mythology and Nonsensical Fantasy? For some readers, it may be enough to read Homer’s amazing words and simply consign such descriptions to the stuff of ancient mythology and nonsensical fantasy. But for others, myself included, archaeologists offer convincing proof that such incredible weapons as Homer describes did, in fact, exist. Thus it’s simply not acceptable to consign Homer’s glorious weapons forged by Hephaistos for Achilles merely to the dustbin of ekphrastic figments. By reverse engineering Homer’s description into artistic representations of Hephaistos forging Achilles’ glorious weapons, artists have charmed us with their interpretations practically since the very first narration. Represented by some of the finest artists in History, the invincible armor of Achilles has enjoyed a very long and glorious career — especially for something that supposedly never existed. Please feel free to note your favorite ekphrastic image of Hephaistos forging Achilles’ armor, or list any others that I may have missed–your feedback and comments are always welcome! VII. 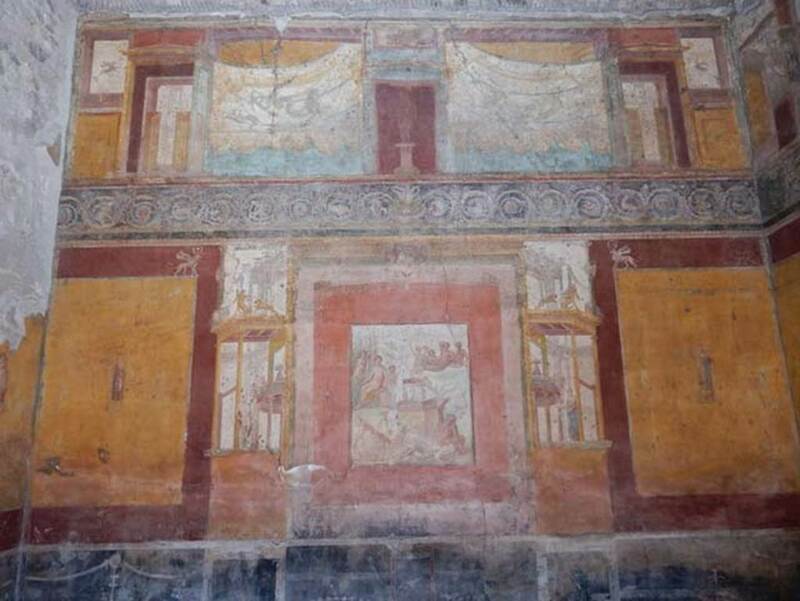 Thetis at Hephaistos’ Forge Waiting to Receive Achilles’ New Weapons, Wall Fresco from Pompeii, ca. 75 – 100 CE. XXV. Vulcan at Work on the Armour of Achilles, Painting by William Heath Robinson, ca. 1872-1944. Hi Kathleen, I absolutely love this post, but then again I love anything associated with Achilles .Superb illustrations and so well documented Thank you. Thanks so much, Rita! Cheers to a happy lunar new year and more fun with Achilles for both of us this year! 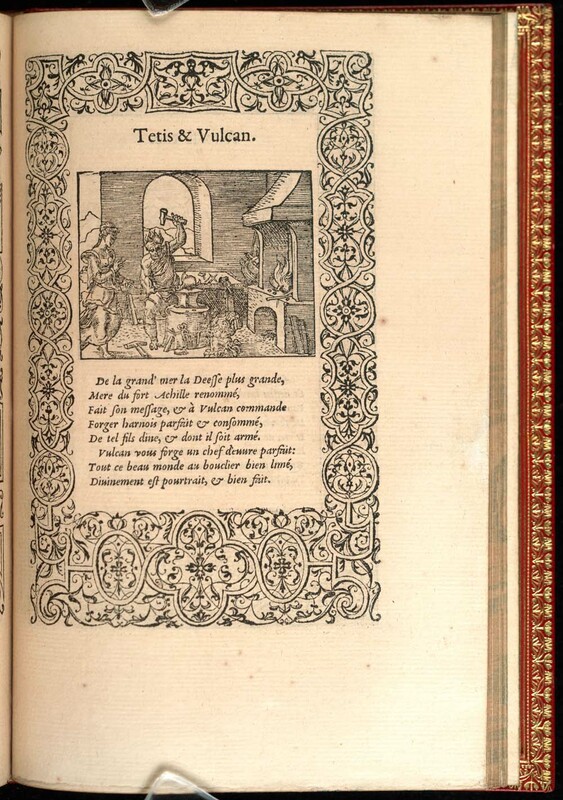 Thank you for such a superb post.Well-written and accompanied by glorious images.I am so happy to see that Greek history and Mythology still inspire and influece authors and artists. Wonderful to see you, Dear Doda! Thanks so much for your comment – yes,I agree with you, it’s amazing and wonderful to see the reality of Achilles’ kleos expressed artistically throughout the ages! My pleasure,dear Kathleen!Perfect use of the word “kleos”,it is so apt for your brilliant post!